We would like to tell you about some of the activities that have been going on at the parish in Macael to prepare for Christmas this year. We hope that it all has really been a good for souls and pleasing to Our Mother. The danger during these days is that of getting absorbed in so many things that we forget what’s really important, or that of living it in such a way that our soul goes off track instead of centered on what’s essential… Right? In our dear town of Macael, there’s a nice custom of celebrating what we call the “Masses of Joy.” On the nine days before Christmas, we celebrate these special Masses at 9:00 p.m. in which we intensify our preparation to receive the Child Jesus. In spite of the cold, several families make it a point to come and bring their children. The town band enlivens things with its merry Christmas carols. 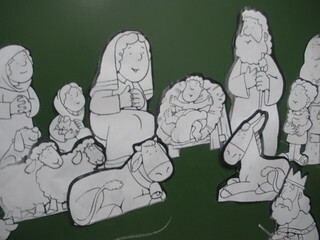 To finish each day, there is a drawing for the kids to see which house the Child Jesus is going sleep in that night. 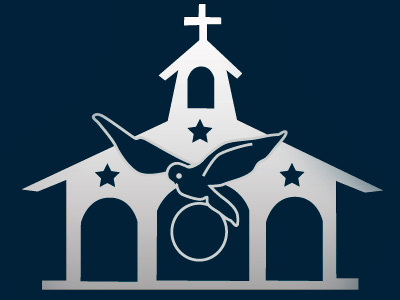 The winner takes a statue of Baby Jesus home on a cushion, and when he or she brings it to Mass the next day tells everyone how he or she has taken care of Him and what prayers he or she said. We also prepare a festival with the Catechesis to prepare our hearts and rejoice. All the children who go to Catechism participate, and in the midst of the rush and as well as possible, because it’s very difficult for all of them to make it to the rehearsals… each year a small festival turns out… As always, Isabel, a great woman who we nickname ‘Gunpowder,’ because she works as if she had gunpowder in her, and is an artist, helped us with the decorations. This time she helped us with the dressing room, designing the outfits of the kids in primary, who this year turned into mini town bands. Accompanied by the catechists, who are just so nice, also dressed as town band members, sang to us with their guitars, tambourines and flags. The kids in secondary performed a beautiful Christmas song that was so joyful that everyone began to dance. Those in third, who will make their First Holy Communion this year, made us laugh with a little show. Besides all of this, we had the privilege of having a practically authentic Holy Family, thanks to the generosity of the catechists. The coordinator was St. Joseph who looked just like a holy card. Another catechist who became a mom a little while ago was the Blessed Virgin Mary, and had her little girl dressed up as Jesus, who, by the way, was so good and did not cry during the entire festival. It has also become tradition to visit some of the sick and elderly people in the town. On Saturday, the 17th we went to the local nursing home with a group of girls and women, who demonstrated their goodwill and courage leaving home on a very rainy afternoon. We nearly had to swim to the nursing home. Wet and happy, we went singing, dancing and chitchatting with the elderly people on the different floors of the nursing home. Another afternoon, we went to visit some of the sick in their homes. We went to a few houses and left them a small gift that we had made with the young girls. We sang Christmas carols to accompany them and make them happy as we were drawing close to Christmas. 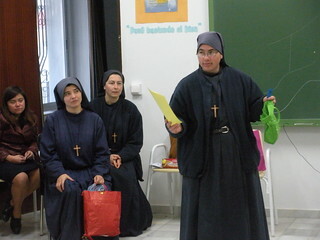 On Thursday, the 22nd we were able to have a party with the catechists, women, girls and sisters. We ate lunch, sang, played some games and reflected while watching a good movie. The atmosphere was full of joy and fraternity and it warmed our hearts to that they would be ready to receive Our Lord on Christmas Eve. Is Our Lady happy with everything that we have done? What we desire is that the Holy Family might find in Macael, a town ready to receive the Lord, who comes to save us.